"As the forms of an old culture die, a new culture is created by the few who are not afraid of the feelings of insecurity." Professional ecologists examine animal and plant systems within the context of their relationships with their environments, with special emphasis on the relationships of different life forms and their interdependencies. Therefore the relationship between the members of a specific species (i.e. us) and our effect on our own environment is also a subject of research. In this study, we have attempted to analyze and explain the ecology-sensitive approaches taken at the main centers of "Central Business District" (CBD) planning, towards an evaluation and development***** of the present natural/ecological data in city centers. During the planning of old and new city centers, the "Ecological Approach (ECOCBD)" aims at the search for eco-friendly "Sustainable Center Planning" mindsets, such as the evaluation and development of the natural/ecological data that are present as linked to the city's macro form, economical use and development of matter and energy in the city center, or the development of a healthier and more environment-sensitive infrastructure. In our country, as in the entire world, as a result of the rapidly expanding consumption and waste generation especially with the rising onset of increased rural-to-urban migration and population growth, the ecological balance has been shifting off-center through the gradual lessening and pollution of natural resources. To withstand this change that will affect the way of life of today's and future generations both, especially during the recent years, experts from numerous branches of science, politicians and local governors have been working to create solutions to this problem. Among these are the sciences of "Urban Planning," "Architecture," "Landscape Design," "Infrastructure Engineering," "Ecology Engineering" etc., which have embarked upon a study upon the basis of "Sustainable Development", which is an internationally understood mindset. Building upon this basis, it is possible to observe the emergence of sustainability and more eco-sensitive approaches for the planning of new cities and the replanning of old cities. The first priority in the development of an environment-sensitive central business district (CBD) is to systematically define the environment-sensitive planning goals and environmental standards (for air, water, soil quality, noise etc.). Where these principles will be incorporated in the design process, at which phase of the design, how deeply, and how, should be ascertained. Legal, governmental and financial precautions should be worked out in this direction. In the Age of Antiquity, the historical core of many cities were established on an easily defendable hill, termed "The Acropolis". The city would then grow around or to one side of the Acropolis, in concentric, ever-widening circles (3). The lower parts of the city were called "AGORA," meaning where the public gathers. The Hellenes and Romans used to gather at the agora for their political, commercial or social business. Along with the political and commercial developments, the temples to the city's gods, social and cultural buildings, and governmental buildings increased in number and spread around the center. 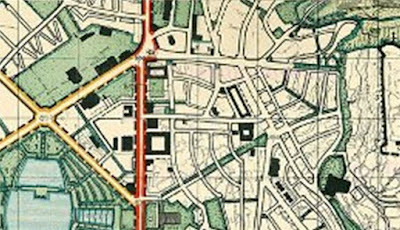 All the public buildings and columned passes (stoas) had the tendency to cluster around the agora. Even though a holistic planning approach had not existed in this period, it is understood that wind direction, sun direction, natural formations of the land and the interaction of different buildings were effective in the positioning and placement of commercial, religious and social structures (such as agoras, theaters, stadiums and gymnasiums). Bergama is one of the most important antique-era settlements of the Aegean region. Its climate is hot and dry in summer and warm and precipitous in winter. The city was formed in terraces and in three main city parts, 330 meters above the plain. Water was brought to the city from the Madra Mountain, which is 20 km away, through a technique that applies the joint-containers principles of physics. One of the most important structures in the city center is the world's steepest theater, with a capacity of nearly 10000 people. This has been built by taking the prevailing wind direction (from the west) into account. Every word spoken on the stage can easily reach someone sitting at the very top. As in many antique towns, the shops at the Agora and the theater terrace were arranged to create wide-eaved, shady places. The temples (Dionysos, Trajon and Athena) and palaces (Attalos and Eumenes) were used at the highest elevation around the theater. As for the Middle Town of Bergama, the gymnasiums (higher, middle and bottom) and temples (Demeter, Ascleopios, Gymnasium) were again placed to fit and arrange the topography. Perge is one of the most important antique-era settlements of the Mediterranean Region (Pamphylia). The region bears the properties of a Mediterranean climate, with the summers hot and dry and winters warm and precipitous. The city was established at an Acropolis and had spread towards the plain to the south. The Acropolis was set on the hills of Iyelik, Belen and Koca Belen, which are open to the air and the winds and have a good view, and thus are fit for settlement. As the city spread towards the plain, it was planned to fit a grid system and the "Columned Street" was created to carry the cool breeze that comes from the south, from the Mediterranean Sea. This road reaches all the way to the city fountain (nympheaum) at the outskirts of the Acropolis in the north, drawing a gentle curve over the plain. In the south, another large fountain to be found at the city center that was established around the Hellenistic city gates also served the populace. The fountain to the north used the water from a source in the Acropolis, and the water created a microclimate in the whole city by flowing down the middle of the columned street. A similar structure was to be found, until recent years, in the Ataturk Street in Antalya; this has been shut down due to pollution. 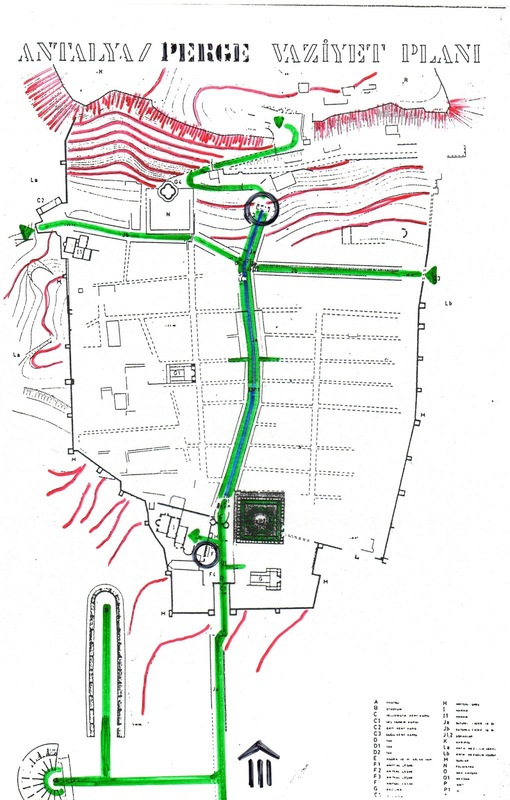 In Perge, underlying this water system, we can also find a Roman period sewer system. To both sides of the columned street were shady shops with wide eaves. Around the square-planned Agora, there were shops, with columns and supports, that provided shade. A large bath-house and gymnasium to the south served the citizenry. 1. Effective use of the topography: Commercial, governmental and social buildings such as theaters, hippodromes, agoras, temples, gymnasiums, palaces etc. that are in the city center were placed through the use and development of already-existing topographical possibilities. 2. Establishment of pedestrian-focused places: The city centers are prominently used as pedestrian spaces for social and governmental activities. 3. Making use of climate data such as the wind, sun etc. : In the placement of structures and places, climate data were considered, with precautions against the heat and cold of summer and winter. 4. Orientation, the creation of open and shady places: For protection from the heat and the cold, structures and places are oriented correctly, so as to create open and shady places. 5. The use of microclimatic elements such as water and greenery: Both in structures and in open places, cooling and relaxing elements of water and greenery were utilized. 6. A definite system for waste gathering: Underground sewer systems were set up. 700 years after the time of Hellenic and Roman theaters, agoras, stadiums and forums, the Turks came to Anatolia. Many famous towns had been, by that time, destroyed and abandoned. It had been a long time since the Greco-Roman plans for cities had been forgotten. As for Byzantium cities, there were still commercial buildings of the inn and bedesten type. Ottoman-Turkish cities are not planned cities. Cultural and socio-economical needs were met at the town center. Commercial places and craftsmen were concentrated at certain streets, like the grocery market, the tailors' street, the butchers' market, the carpenters' market, the secondhand shops' market, the confectionary market, the cutlery market, the cobblers' market, the saddlers' market etc. In Ottoman cities, when mosques, medressehs, domed tombs and bathhouses were built, inns were built immediately next to them. As cleanliness is significant in Islam, bathhouses gained special significance. Among the Islamic communities, only the Turks built bathhouses in great numbers and linked them to the other religious, cultural and social establishments . Bathhouses, as a part of the religious, cultural, social and health establishments, were built extremely close to commercial places. The bathhouses, fountains, water-transport systems and arches are the effective solutions to the water problem in Turkish cities. There were about 20 bathhouses in Istanbul during the reign of Mehmet II (The Conqueror). During this time period, in-building markets (the equivalent of today's American malls, without chain stores) were emphasized. "Bedesten"s are well-built and safe in-building markets that were initially established to sell cloth, and then set for the trade of valuable items and antiques. The in-building markets and commercial inns that existed during the Seljuk period were converted to bedestens during the Ottoman period. The number of inns and bedestens changed according to the size and commercial capacity of the cities. The inner courtyards of inns were relaxing, with all four sides closed, plane trees planted to create shade, and microclimates created with fountains and pools. "Arasta" is the old name for markets with a covered roofs or eaves on their shops . The shops were usually placed on both sides of a street? Commercial inns provided shopping and storage spaces to meet the daily needs of the citizenry. "Today, Bursa is one of the most characteristic Turkish cities in terms of its civilian marketplaces. The paths shaded by centuries-old plane trees and green forests, the shops with wide eaves, create a harmonious effect. The grapevines also have numerous advantages. For one thing, since these dry out in winter but bloom in summer, they provide cool and shady roads during summer. However, they do not completely block the roads' and shops' access to open air. Moreover, they tie together all the individual shops, be they pretty or not so much, and create a harmony and unity over all of them. The overhead part of the long market, open today, is almost completely covered with grapevines over summer, with a very pretty overall effect. The enormous, majestic centuries-old plane trees sometimes found at wide squares and intersections make Bursa markets especially singular." Bursa Commercial Center was established on the outskirts of the Uludag Mountain, on a wide plain lying on an east-west axis. The Uzuncarsi (Long Market), inns and in-building markets appeared as pedestrian places in this axis. Fountains and pools and internal spaces with plane trees are the best examples of water and greenery used in tandem. The Bursa Ulu (Great) Mosque and Orhan Mosque were built during the early development period of the city. During the reign of Thunder Beyazit, the town center developed with the construction of the main Bedesten, and the commercial center spread over a wide area with the constructions of the Geyve and Ipek (Silk) Inns, the Sipahi (Rider) Bazaar and the Karacabey (Black Lord) Inn. The Koza (Cocoon) and Pirinc (Rice) Inns were also built during this period, and the economical, commercial and governmental leadership of Bursa continued until Istanbul was conquered. 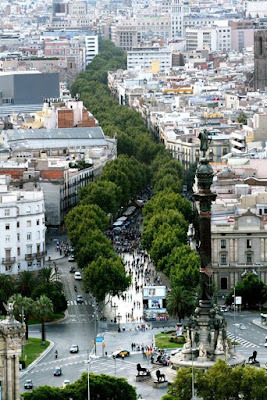 During this period, the city is an important commercial center, with rich, pedestrian-focused spaces where water and green are combined. 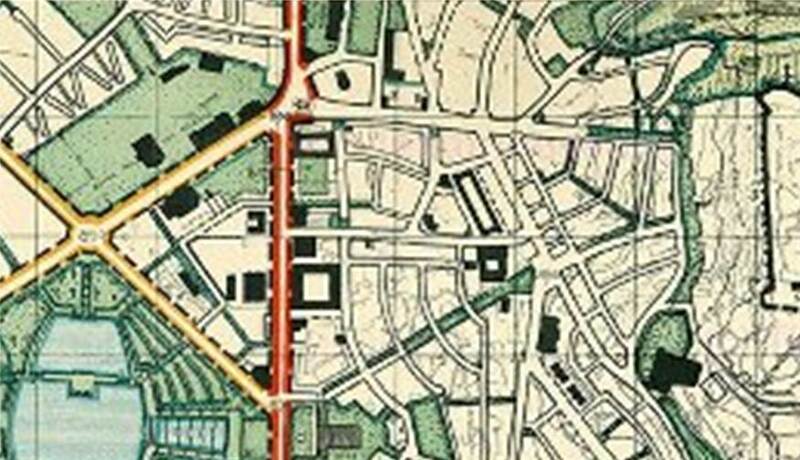 "Green / Pedestrian System For Ankara "Development Plan For Old Ankara" Prof. Hermann Jansen, Alaeddin Kiral Publishing house, Istanbul, 1937. As one of the last representatives of the "Garden City" movement, Prof. Jansen has conceived the city as a "Garden City" in the 1932 Ankara Development Plan. In the making of development decisions such as the Genclik Parki (Youth Park), creek valleys, sports areas, the Ministries, the Bahcelievler (Garden Houses) district, and the "Protocol" areas (The Citadel and its immediate environs), natural and visual data as well as the preservation and utilization of historical values were considered carefully. Beginning in the 14th century, the old city center of Ankara has developed in the form of traditional production and trade centers, such as the Cikrikcilar (ropemakers) and Saraclar (saddle makers) areas that grew around the squares of Atpazari (the horse market), Samanpazari (the hay market) and Koyunpazari (the sheep market), which lie in front of the Citadel. During the 15th century, around 30 commercial inns (Tuz (Salt) Inn, Zafran (Saffron) Inn, Cengel (Hook) Inn, Cukur (Hole) Inn etc) and the Mahmut Pasha Bedesten were set in this area. After the 16th century, going along with the economical development of the town, the Tahtakale ("Woody citadel", but distortion of an Arabic original name, "Taht'el Kal'a"=="The Throne of the Citadel") and Karaoglan (Dark Boy) Markets grew around the lower location of Suluhan (The Watery Inn). It can be observed that orientation as well as fitting the topography is important in the development of the city center, with the main development lying in the western and southern directions. Inns and commercial streets were elected to be placed around the Cuma mosques, with the elements of greenery and water present in internal and external spaces, similar to the Bursa example. There is a little decorated mosque with a fountain in Suluhan. We can see that the Mahmut Pasha Bedesten and the inns in front of the Citadel are oriented in the northeast/southwest direction. Streets that hold the traditional commercial units (Cikrikcilar (ropemakers), Saraclar (saddle makers), Uzuncarsi (The Long Market), Sipahipazari (The Riders' Market), Iplik Pazari (The Thread Market) etc.) are generally narrow, shady streets with low buildings. Fountains are placed in various small squares in front of mosques. As in the Bursa example, there are bathhouses close by the commercial spaces (Haseki, Tahtakale, Karacabey, Sengul Bathhouses). "The use of thick and tall walls of cut stone (calcer) and earth-thatched, vaulted roofs, through the material selection and plan applications both, has considerably relieved the summer heat, that can hit 40-45 degrees Celsius in the shade in summer. Keeping the streets narrow and the walls high has created a shady portion of the street to walk down without the risk of sunstroke for almost every hour of the day..." Mehmet A. Maras, "Sanliurfa, the City of Prophets," Birlik Yay., 1986, p.63. The Sanliurfa historical city center is placed below the Urfa Citadel, close by the Fish Pond and religious works (Halil-ul Rahman etc.). The city is an oasis in the extremely hot and dry climate of Southeastern Anatolia. The Fish Pond gives life and vitality to the region by its water and greenery, along with the legends associated with it. It probably is not a coincidence that the commercial center is placed right next to it. Inns (The Gumruk (Customs) Inn, Veli Bey Inn etc. ), closed bazaars and the traditional commercial streets (Huseyniye Market, Kazanci (Cauldron Makers) Market, Bicakci (Knife-Makers) Market etc.) are concentrated in a rather tight formation in a small area. Traditional production and trade units such as saddle makers, felt makers, perfumeries, hardware shops etc. have picked spots in streets set aside for their kind. As in the streets of the Urfa historical city proper, narrow and shady streets, overhangings and the like are heavily used in the commercial district. There is a small canal/water system built among the inns, with its start in the Fish Pond. This both provides drainage and creates a microclimate where it passes through. The courtyards of the inns are green, shady places with fountains and pools. The houses of Urfa also have shady, pooled, green courtyards and outside porches that open to these. 1. Small Building Islands: Building islands formed by shops that are usually between 2-4 meters wide are 4-8 meters deep. Between them are streets 5-7 meters wide, with the street area wider relative to the settlement area (more than 50% wider). 2. Single-story Shops in General: Even though upper-story storage areas can be sporadically seen, traditional commercial centers are single-storied. 3. Protection from the Sun: The markets usually feature protection from the sun and the heat, with several species of ivy, grapevines etc. utilized to obtain shady places that are not cut off from the wind. 4. Building Techniques and Materials: Even though there are some markets built using wood only, we can also find markets built of brick, stone, rubble, and sometimes using mixed techniques or formed of cut blocks of stones. 5. Functional Relation of Utilities: As various utilities were placed, their functional relationships to each other were considered as well, with social, religious and health-related establishments, fountains, bathhouses, and water-transit systems built as integral pieces of commercial buildings. 6. Environmental Sensitivity in the Forms of Production: The forms of production exhibit an attempt to preserve and improve natural resources; their placement displays a care for natural elements. For instance, tanneries established for leatherworking were carefully placed, both in that their location made sure the sight and smells would not disturb the city people, and in that the water they used would not mingle with the water set aside for other usage. The principles that should govern an "Ecologically-Sensitive" approach to central business district planning are summarized below. "Sustainability" and "City Ecology" concepts and principles should prevail in the design and application of a CBD. In such a central business district, which can be defined as an "ECOCBD", it should be possible to use solar power directly with no in-betweens, with planning/project stages considering this aim. In cities, where many people live together concentrated in a certain area, using solar power will not enable people to carry on with a life standard that they are used to keeping, but also emerge as a very strong alternative in case of possible energy crises. Humanity is moving towards an urban civilization. It is rather probable that not too far ahead, the ratio of urban population to rural population will increase sharply, with about 80-90% of the population living in cities. It is also a rather considerable possibility that the amount of energy required by urban life will increase tenfold from today, with pollution increasing in a corresponding manner (Goksu,C., "The Sun and the City,", ODTU Fac. of Architect. Publ., 1993.) The loss of current energy sources would be catastrophic for cities and city centers that use up a great amount of energy. Thus, the chances of survival for cities and CBDs that were developed to use that endless source, the Sun, would rise. The effective and energy-conserving use of elements such as the direction of the sun and prevalent winds, heat, radiation etc. in planning, urban design and architecture. Arrangements for minimum energy usage in the design of microclimatic elements such as access to the CBD, intra-CBD transportation, illumination/air conditioning/heating of the CBD (both in the environment-level and the building-level design). The use of technologies for regaining energy from sources like electricity, solar, natural gas etc., and of technologies related to the on-location sorting and recycling of waste (such as solid/liquid trash, biological waste etc.). The use of solar energy in heating and illumination of buildings; the use of environment-friendly vehicles that work on electricity and alcohol within the CBD; the establishment of recycling facilities for the recyclable waste such as paper, glass, metal, chemicals etc. ; the use of present building stock in the area for as long as possible through extending their lives as much as can be done and subsequent maximum reuse of their materials etc. Minimizing infrastructural and structural problems through good use of the land. Evaluating and utilizing the geological structural and building possibilities. Using good soil excavated from building areas by transporting it to park areas. Evaluation and improvements on present natural resources such as the current-day flowing water, flora, fauna etc. Maximizing the per-person greenery surface area within the CBD; keeping the ratio of green areas within squares/buildings as high as possible. Improvement and utilization of already-present flora; research on plant species suitable to the region for use in parks, open and closed spaces. One of the fundamental principles for a sustainable CBD is easy accessibility, which is very important for energy and time conservation while getting to the CBD from the other parts of the town and ease of intraoperation. Rail systems that run on electricity, such as monorail and fast rail systems, trams, subways etc., would meet the majority of the demand for to-CBD transportation. So that pedestrian regions can be formed, the entry of private vehicles to the CBD should be as limited as possible. Private vehicles should be kept at underground or 2-3 storied regional parking lots around the CBD. Pedestrian walkways/alleys/promenades should be planned for pedestrian traffic within the CBD. City squares should belong to pedestrians exclusively. Closed bazaars/inns/gallerias within the center should be planned for pedestrian use only, and bicycle lanes should be placed in the promenades so as to encourage bicycle use. Service vehicles should serve areas within the CBD only through controlled service ways set aside for that express purpose. However, it should be kept in mind that in the case of fire or health emergency vehicles or trash collectors, such vehicles might need access to all areas, even the pedestrian roads and squares. Internal services should be provided with environment-friendly, battery-powered vehicles. Designs for implementation within the CBD should be as respectful to the surrounding historical architectural heritage as they are of a quality to strengthen the image of the town nationally and internationally, by emphasizing, in the architectural and environmental scale, the social, economical and cultural position that the country attained in the 21st century. The "Modern City" image should be accented through the designs of pedestrian regions, squares, open and green areas as well as through architectural and urban furniture designs. One of the most important implementation problems to be solved in the design of a 21st century ECOCBD is the infrastructure. Designing, staging and implementing the infrastructure turns out to be a significant matter for an environment-sensitive, sustainable, modern new city center design, especially considering that the actual building can not take place until the infrastructure has been built. Within the complicated infrastructure pattern within the CBD area, each infrastructure component should be considered individually, planned, transformed into projects, detailed and implemented in stages. Infrastructural systems such as electricity, water, sewers, natural gas, fire prevention, communication etc. should be planned and transformed into projects according to the applications created through the urban renewal of the CBD. As these projects are finalized, care should be taken to ensure an economical budget, sustainability, recycling ability, the use of modern technology and the reuse of already-existing infrastructural systems. The following methods, which are tailored for public and private investors, can be considered in the financing of renewal and transformation operations within the CBD. Such operations, leaning heavily towards ecological planning, can also have the aim of increasing the prestige of the CBD in question. Since it was made the citadel, Ankara has provided an example for urban planning within the country. Indeed, for the replacement of the Old Ankara with the New Ankara, the special law titled "On The Expropriation of Swampland and Mergazi Land by the Municipality for the New Districts to Be Built in Ankara" was published on March 24, 1925, with the number 583. Thus the obstacle of the "Ebniye Law" was overcome and a position taken about the development method of the "New Ankara". 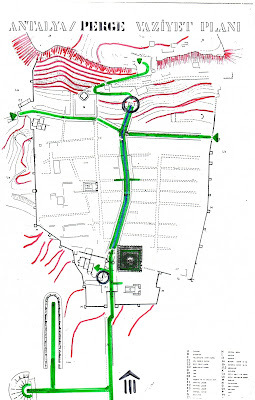 (Specifications for the Contest of Ankara Citadel Preservation and Development Project, The Municipality of Altindag, The Ministry of Culture, 1987, p.67). Local governments are weak, and the development of CBDs through an ecological planning approach is not a burden they can undertake. A "Law for the Development for Central Business Districts" should be prepared; but this should not ignore the failings of the previously mentioned law while being designed along similar directions with it. This law should provide simplifications for the processes of implementation, publicization/trade, and create provision so that at least a part of the profit to be made during the development of a CBD would return to the public and local governments. * "Bureau of Local Government Land"
* Providing the ability for special applications such as the build-manage-rescind model and similar models. I.1.a. An Application of Point 18: Through applying this point of law, a portion of land up to and sometimes exceeding 35% of the surface area can be taken for roads, parking lots and greenery. However, such an arrangement partnership share cannot be taken for a second time from areas that Point 18 has been applied once. Attempts should be made to obtain the arrangement partnership share from the profit created vertically and underground as well as taking it horizontally. Deep changes in the Building Law are required for this to come to pass. II.1.b. Publicization: For public use areas such as roads, parking lots, greenery (parks, kindergartens, sports areas etc. ), an application exists within the Point 18; for areas beyond this, the Municipality has authority to publicize. Considering that local government budgets are limited, new resources are needed for such applications. Such resources will be created during the development of a CBD.